This is the view from the park bench under the Harbour bridge where I signed the contract for my next novel with an independent publisher on Thursday. I had long ago stopped imagining that moment, but as it happened it was nothing like I would have envisaged. 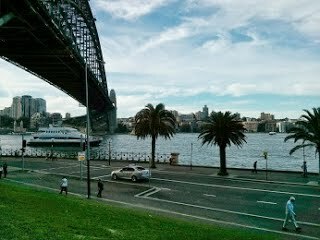 It was the kind of balmy late autumn day that Sydney excels in, there was a quiet bustle of people in the park and along the road. Nothing extraordinary happened around us, no one noticed it. It was still and beautiful. I spent the morning and most of the next day at the Sydney Writers Festival, working on my last (mild) sunburn of the year. As I walked back past this spot on Friday afternoon, and then down through Circular Quay and through the last minute construction for the Vivid Festival, I felt again why I love Sydney so much. For me, Sydney just is, it doesn't want or care about your approval, even without festivals and museums and harbour side cafes, it is beautiful. It reminds me of a quote I can't quite remember from one of the Pythons. Whichever one it was said that they all had to work hard to be funny. Except John Cleese. He was funny just by existing.